This is the powder room with the barrels (one open with a ladle), three drawer cartridge chest (white cartridges in tray), and partitions on port side, typical cabins in the bow as well. 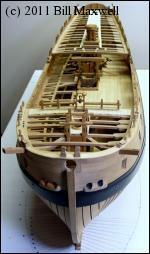 Overall bow shot of deck showing various deck items (pumps, capstan(s), belfry, etc.). 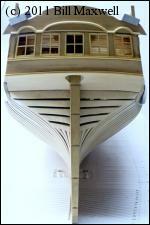 Overall stern shot (before carvings are added) with window sashes temporally installed. Mica glazing will be installed at final installation, like in the window in Pic. 1617. Deck pumps, chain pumps (with cranks) and the break pumps in the foreground with pump handles. 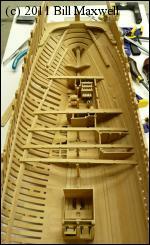 Everything will get permanently installed once the rest of the quarter deck 'furniture' and planking are completed. Forecastle bulkhead: raised panels (typical on this deck) and rail with belfry. Functional doors on port, starboard not built out. A 'functional' Brodie stove (brazed and riveted sheet brass) to the right of the bulkhead.